Take the I-5 Union Street exit and follow Union west to 1st Avenue. Take a right on 1st, and look for the Showbox marquee on the right side of the street. Take I-5 to the Seneca Street exit (#165 from the left side of the freeway), and follow Seneca west to 1st Avenue. Take a right on 1st, and look for the Showbox marquee on the right side of the street. Take the I-5 South to the Union Street exit, and follow Union west to 1st Avenue. Take a right on 1st, and look for the Showbox marquee on the right side of the street. Take Exit 2C (I-5N to Madison St./Convention Place/Vancouver BC). Take ramp toward Madison St./Convention Place. Take a left on Madison St. Take a right on First Avenue, and look for the Showbox marquee on the right side of the street. Take the I-90 E exit (#164 toward Bellevue / Spokane / 4th Ave S.). Then Take the I-5 South exit toward Tacoma/Portland. Merge onto I-90 W toward 4th Ave S. Take the exit towards QWEST FIELD / CITY CENTER. Turn right onto 4th Avenue South. Turn slight right onto ramp. Turn right onto S. Atlantic Street / Edgar Martinez Drive S. Turn left onto 1st Avenue South. End at 1700 1st Avenue South, at 1st & Massachusetts — brick building on left side of the street. Take the W Seattle Bridge / Columbian Way exit, #163. Take the Spokane Street ramp toward Safeco Field. Turn slight right onto S. Spokane Street. Turn right onto 1st Avenue South. End at 1700 1st Avenue South, at 1st & Massachusetts — brick building on right side of the street. Take the exit towards QWEST FIELD / CITY CENTER. Turn right onto 4th Avenue South. Turn slight right onto ramp. Turn right onto S. Atlantic Street / Edgar Martinez Drive S. Turn left onto 1st Avenue South. End at 1700 1st Avenue South, at 1st and Massachusetts — brick building on left side of the street. The Showbox and Showbox SoDo are served by Link Light Rail and numerous bus routes. 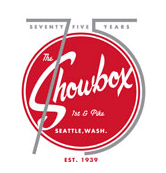 The Showbox is a five minute walk from University Street Station and Showbox Sodo is a 15 minute walk from Stadium Station. For details and trip planning tools, visit Metro Online or call Metro Rider Information at 206.553.3000, or Metro Accessible Services at 206.263.3113. For Community Transit, call 425.353-RIDE or 1.800.562.1375. For Sound Transit, call 1.888.889.6368 or TTY Relay 711. Real-time downtown parking information available at e-Park.